Bee Inspired – “A group of new friends, scattered across several continents, connected by a common hobby"
Karen’s Bee Block is Done! Last year, each of us took turns selecting a block for the other Bee Inspired members to make for us. I was doing fine until a series of unfortunate events late in the year derailed me. Try as I might, I simply couldn’t get that train back on the tracks. I’m determined however to make those blocks. As proof, here’s one of them, finally! She requested that blocks be mailed by March 15th, so I’m just under the wire. 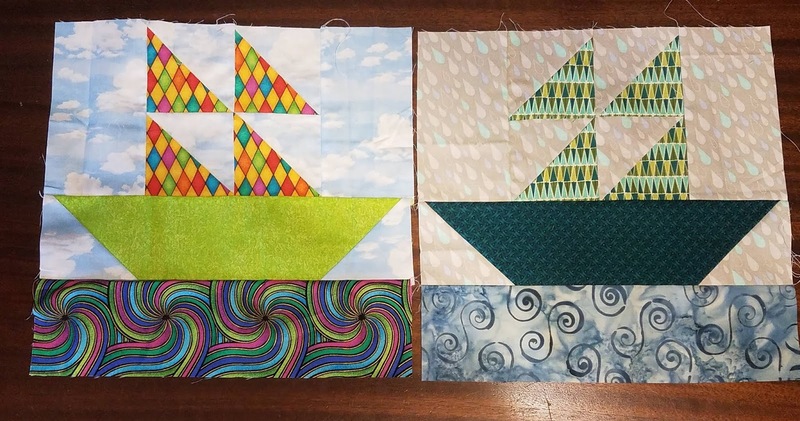 If you are interested in contributing to one of our charity quilts, Ann is our next hostess and she’s accepting chicken blocks through April 15th. You can find more info here. 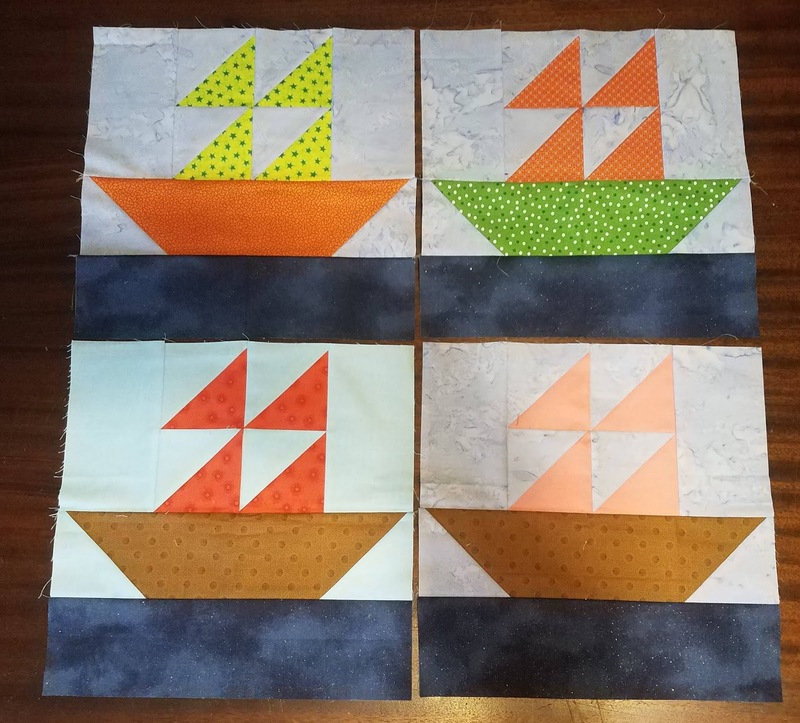 I was the first hostess this year and I asked for sailboat blocks. I received 19, and when you add in the three I made for the tutorial, that left me with 22. Since that’s not a good number for laying out rows, I made three more. I now have 25 boats. 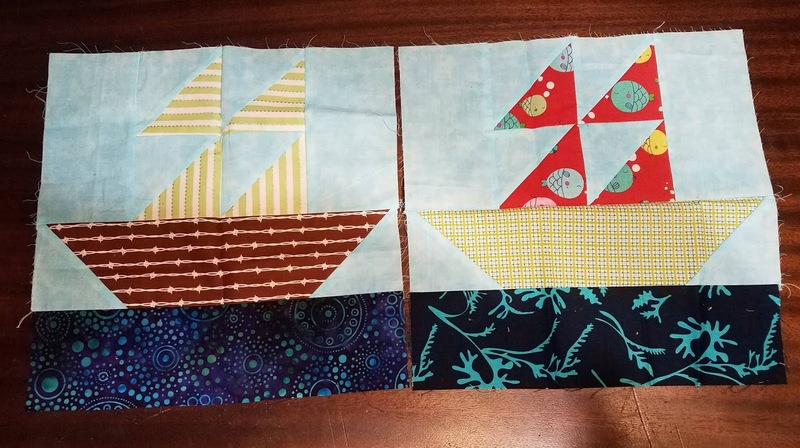 I could do a 5 x 5 layout or split them into two quilts and have a 4 x 4 and a 3 x 3. Since I don’t love working with large quilts, I’m thinking they may end up as two different quilts. I hope to get them assembled soon. So, obviously I needed to make a chicken quilt! Emily’s blog post is here, and she links to the original pattern and tutorial for the Chicken Block: Chicken Quilt Block Tutorial by Sew Inspired. I agree with Emily’s comment in her post that the instructions for attaching the comb is not entirely clear, so I’ll add some instructions of my own here. Please follow the Sew Inspired tutorial to create a 7″x8″ block (6.5″x7.5″ finished). Body Fabric – black, grey or yellow – either solids or prints. I like the look of the quilt that Emily created so the example above is a good one to use. Note when you piece the chicken the 5.5″x6.5″ body piece should be placed with the 5.5″ side as the width and the 6.5″ piece as the height (see the diagram below). I drew this diagram to help with the assembly. I got confused about which way the body was oriented and did it the wrong way the first time. Go ahead and do all the triangle ‘snowballs’ on the edges before you do the comb (through step 4 on her tutorial). 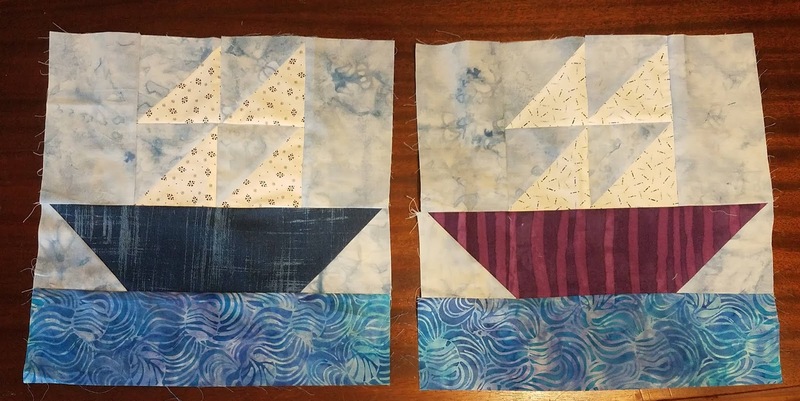 Cut two 2″x2.5″ squares as instructed in the tutorial. Draw a comb shape on the wrong side of one rectangle. Orient the rectangle so that the 2.5″ side is the width and 2″ is the height. 6. Place the comb on the top background strip (2″x5.5″) that already has the chicken body triangle attached. You can see below I drew a 1/4″ line on the right side of the background piece to help keep the comb away from the seam allowance. I should have done the same across the top! 9. Join the rest of the pieces and admire your cute chicken! With my pin cushions I’m really gathering a flock. I hope you enjoy making your chickens, and I can’t wait to see them all! If you choose to participate, please send me your blocks by April 15, 2019. Bee Inspired members have my address, but if you just want to join in and send me blocks leave a comment and I’ll get you my address. 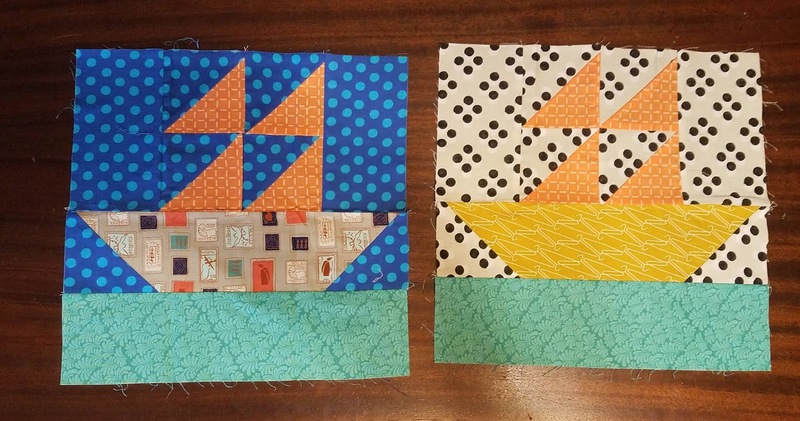 Ann of Brown Paws Quilting sent these two boats. Purple is my favorite color, so you know I love these sails! 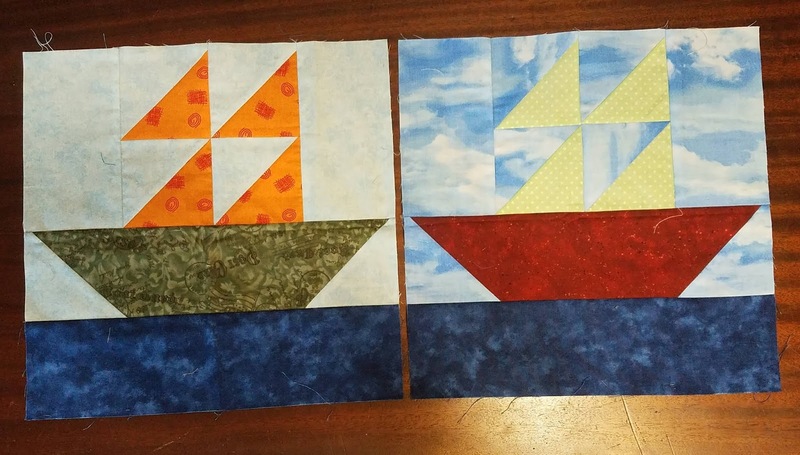 Paige of Quilted Blooms sent these three boats. Don’t you want to just disappear to where the sky is that blue and the water is that clear?? Paige even decorated the outside of the mailing envelope. I was excited to see this in my mailbox! In total, I received 19 boat blocks! Add in the 3 I made as tests/examples, and that’s 22 boats! I haven’t decided on layout yet. I may do 4 x 5 and then use 2 for the back. I’ll post a picture when I have a top assembled.